Tides of Infamy társasjáték - Magyarország társasjáték keresője! A társasjáték érték! A Tides of Infamy egy nagyszerű társasjáték, 2 - 4 játékos részére, az átlagos játékidő rövidebb, csak 1 óra. A társast, 13 éves kortól ajánljuk kipróbálni. A játékmenet erősen épít a fogd és vidd, a moduláris tábla, a szövetségek, a pakli tervezés és a terület mozgatás mechanizmusokra. 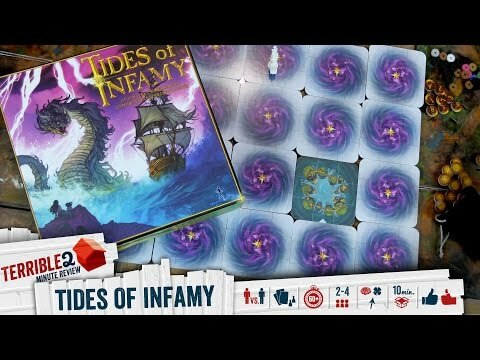 Tides of Infamy is a high seas adventure fraught with peril, where you command your ships in a battle for infamy against fellow pirates, sea monsters, the elements and Pirate Luck. Gain Marks of Infamy by successfully smuggling black market supplies, plundering settlements, salvaging treasure, raiding ships and exploring new waters as you sail into uncharted seas. Be the first to gain notoriety through infamous deeds, but beware, untold dangers lurk in these waters! The object of the game is to obtain Marks of Infamy. The first player to collect 20 (2 players), 17 (3 players), 15 (4 players) or 25 (4 player team play) Marks wins. Each player commands three pirate ships: a Man of war, a Sloop of war and a Bilander, using Movement cards to discover mystic portals, treacherous barriers, pirate bays, seamy ports and treasure islands. Ports provide limited Shadow Trade Tokens for smuggling where each island has a unique Plunder Token that pirate ships can steal. Plunder and Shadow Trade tokens are placed on the pirate ship. Tokens must be safely returned to a Pirate Bay to obtain Marks of Infamy. 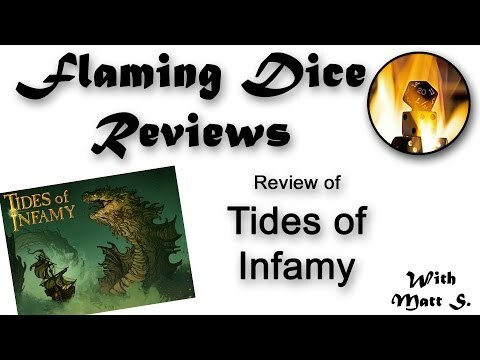 Marks of Infamy are also rewarded by exploring one of the last seven map tiles, weathering a Pirate Luck event or successfully raiding opponent’s pirate ships through Battle cards. Victorious ships also gain any tokens the opposing ship was carrying. Movement cards with a cross bones symbol trigger a special event determined by a Pirate Luck card. The Pirate Luck event affects enemy ships on a selected tile. Players that have previously earned Pirate Luck cards can avoid the event by discarding a card or risk the evils that lay beneath. Are you ready to sail these waters?